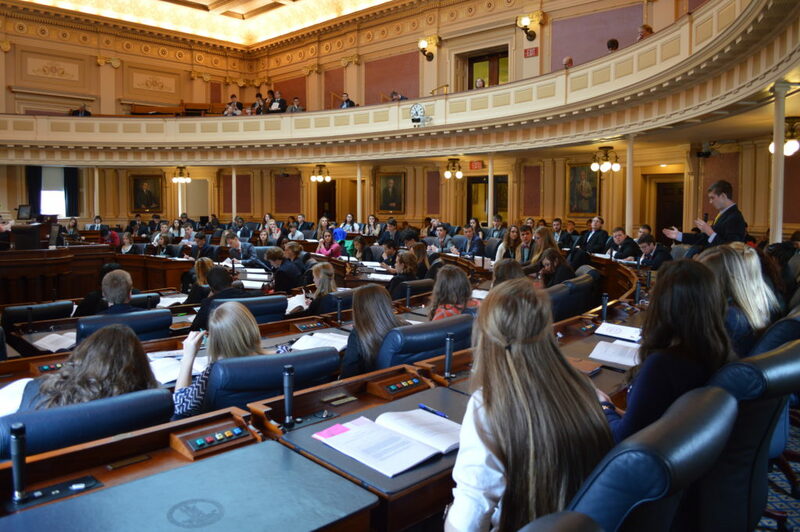 Purpose: The Model General Assembly program was established in 1948 and is designed to introduce high school students to the legislative process of the Commonwealth of Virginia. Legislation is debated in committees and on the floors of the actual Virginia Senate and House of Delegates. Participants: Students in grades 9-12 may attend, with limited roles for 9th graders. Roles: Participants can assume the roles of senator, delegate, officer, lobbyist, reporter, or underclassmen legislator. See the Student Guide document for more information. Legislative Bill: Each club or school group should submit at least one and no more than five bills along with their registration. The Virginia YMCA strongly encourages the patrons of the bill to discuss the bill with a current or former state legislator. All bills should reference the Code of Virginia or the Constitution of Virginia and should be thoroughly researched. Elections: Students who will be juniors at the 2019 MGA are eligible to run for office for the 2018 MGA. Candidate Filing Form is available on this page. Registration: $375 student fee includes conference registration, all printed materials, admission to prelegislative workshops, two nights’ lodging, a cocktail reception dinner, and admission to the Youth Governor’s Ball. See to the right for forms and deadlines. Adult fee is $200 (add $150 for private room – available if space allows). Deposit, adult & student registration, room assignment, payment transmittal forms, and LEGISLATIVE BILLS. Each participant (including adults) should pay their $100 deposit to their advisor prior to this deadline. Any and all credits that apply will be added to the final balance, not the deposit. All forms above may be sent to programs@vaymca.org or manually to Virginia YMCA, P. O. Box 10365, Lynchburg, VA 24506. Refunds will be honored if written notification is received before February 1st. $75 of the registration fee is nonrefundable. Substitutions may be made at any time; however, substitutions should be a straight substitute (same gender and role). Please contact the YMCA to make a substitution.